Antique dressers and dower chests are often used as highlight pieces - single items of furniture that can be displayed in almost any room of the house - the bedroom, living room, dining room or hallway - and stand out as a decorative statement about the owner's good taste and sophistication. This page is all about such wonderful pieces of antique furniture - two marvelous examples include the small simple single drawer two-door antique chest and the magnificent inlaid and hand painted Pennsylvania dower/blanket chest of cedar dating from the 1800's below. Here you will see a variety of early American antique dressers that graced their owners' bedrooms and antique chests that served as such decorative pieces for their owners. If you would like to simply display or to sell your antique furniture we invite you to do so right here. There is no sales commission, only a nominal listing fee. We also invite you subscribe to our free newsletter filled with ideas on buying, selling, valuing and protecting your antique furniture. Visitors Notice: Recently listed items are currently being posted to this web page and so pictures of individual items are not yet available. We take great care in presenting antiques that have been listed for display at 4AntiqueFurniture.com. Please bookmark this page and revisit us soon. If you have any questions please contact us. 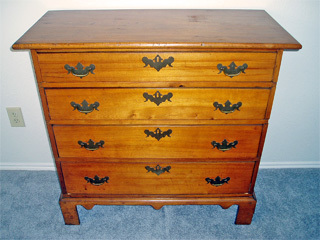 Acquired by its owner in 1938 this light maple chest of drawers served as the owner's son's bedroom dresser growing up. All original hardware and glorious original finish. As beautiful as it is still practical.